Now WebConsole ZFS Admin will work. When you're done using it, you should probably disable the service, as Java will eat up 100MB of memory :-). 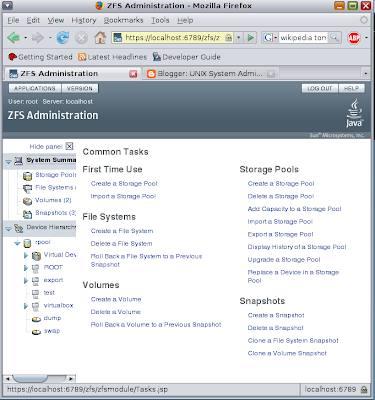 Besides, you don't really need a GUI for ZFS admin. It's just nice to show to your friends. You should also make sure to disable webconsole in your Zones, as it serves no purpose what so ever (and it will bloat your zones by about 100MB memory usage).